“Le Goûter” [The Taste/Afternoon Tea] also known by the English title, “Still Life with a Chinese Lidded Jar” (c.1870–77) after the painting in the Wallraf-Richartz-Museum, Cologne, by Juriaan van Streek (active 1647–87), from “Tableaux de premier ordre anciens et modernes composant la galerie de M. John W. Wilson”, printed and published by François Liénard. Size: (sheet) 33.7 x 24.4 cm; (plate) 20.9 x 16 cm; (image) 16.8 x 13.4 cm. 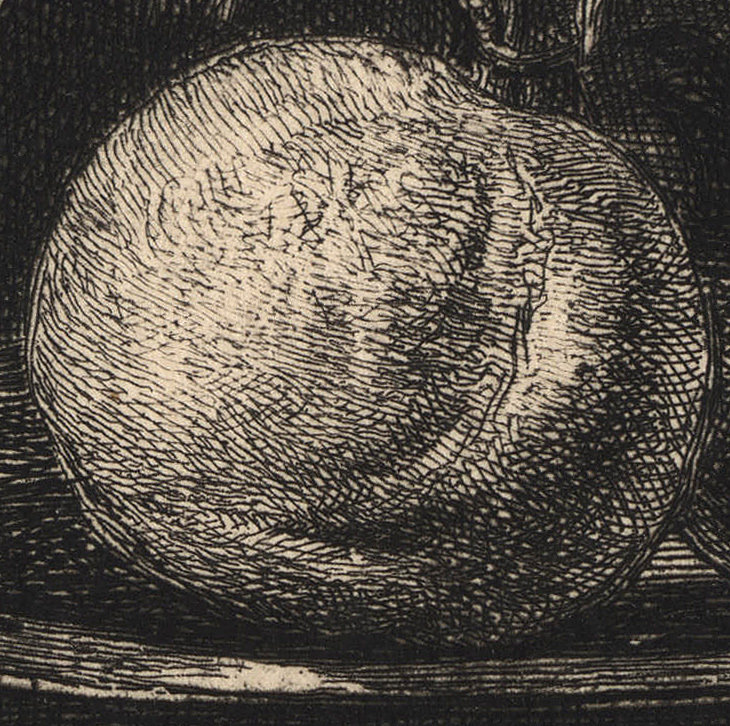 Inscribed below the image (lower left) “Juriaan van Streek, pinx.”; (lower centre) “LE GOÛTER. / Fçois Liénard. Imp. 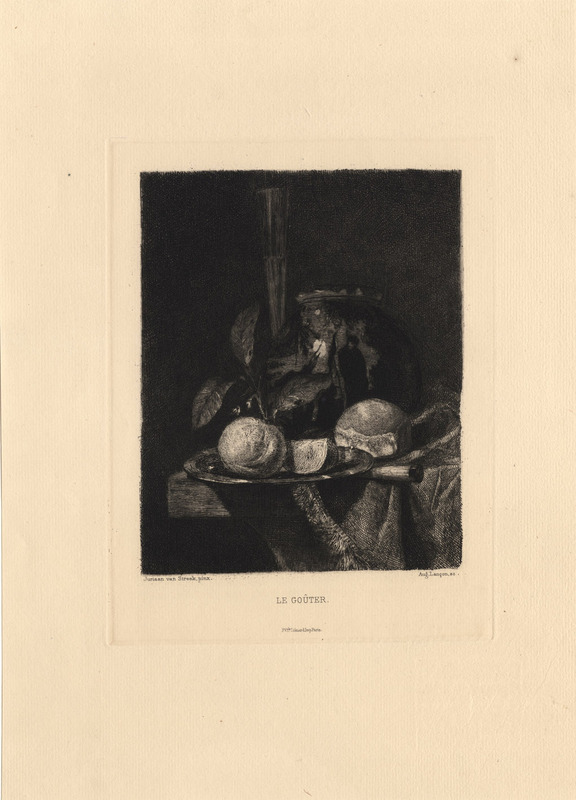 Paris.”; (lower right) Aug. Lançon, sc.” The British Museum offers the following description of this print: “Still-life, after Juriaan van Streek; with orange and orange slice on a plate, and behind a Chinese jar.” (http://www.britishmuseum.org/research/collection_online/collection_object_details.aspx?objectId=3499811&partId=1&searchText=Auguste+Lan%u00e7on+Le+Gouter&page=1). IFF 27. Condition: richly inked and well-printed impression on fine laid paper with generous margins in near pristine condition. I am selling this original and superbly executed etching for a total cost of AU$58 (currently US$42.19/EUR37.39/GBP29.24 at the time of this listing) including postage and handling to anywhere in the world. If you are interested in purchasing this darkly glowing still-life etching from the 19th century, please contact me at oz_jim@printsandprinciples.com and I will email you a PayPal invoice. 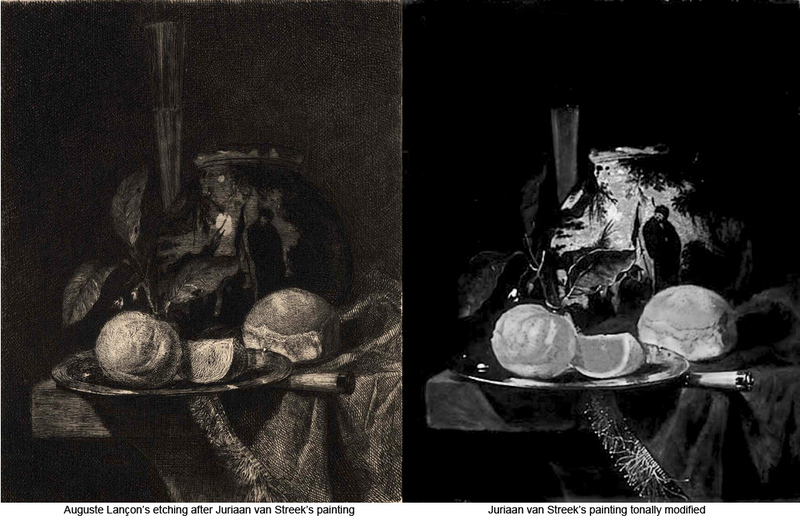 The left image is Lançon’s etching and the right image is a black and white photographic reproduction of Juriaan van Streek’s original painting. The tradition of making reproductive prints (i.e. prints that “copy” the tones, textures and surface patina of other artworks) of master paintings, sculptures and drawings dates back to the Renaissance. For me, the true glory days of the reproductive print was the nineteenth century. 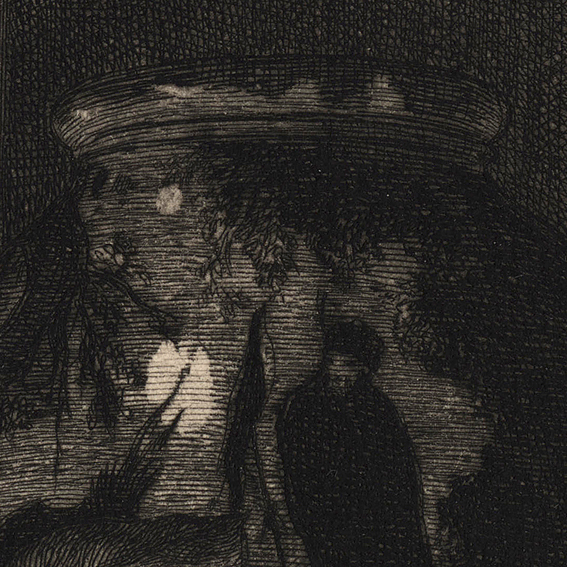 This was the time when printmakers had acquired the technical skills of the preceding centuries and had the discipline and economic compulsion to translate other artists’ works into a meaningful code of lines, squiggles, dots and tones that rivalled a photographic image. Some of the reproductive prints executed during these glory days may seem impersonal and even perfunctory to contemporary tastes. Moreover, they can even look as if they were made by a machine rather than by human hands. 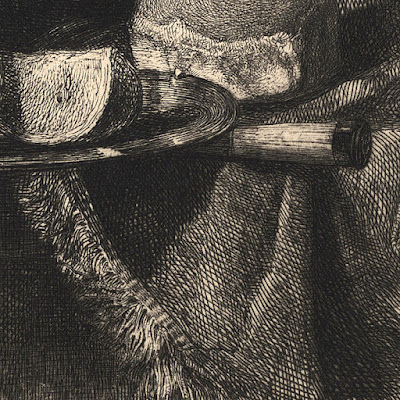 Nevertheless, the finest prints—like this one—are those that portray another artist’s artwork in a way that seems to genuinely capture the essential spirit of the original artwork. By this I mean that the print is able to connote the colour and the facture of the original artwork’s surface (i.e. the quality of an artist’s handling of paint or whatever the medium of the original happens to be) even though the print in reality is only a black and white sheet of paper. As an experiment, I have juxtaposed the print and a black-and-white reproduction of the original painting as a way of evaluating whether Lançon’s etching captures the “essential spirit” of Juriaan van Streek’s painting.